Insect "Frankensteins" have been discovered among fossils from a deposit in Brazil. The prehistoric creatures had the wings and middle-body segments of a dragonfly's, wing veins arranged like a mayfly and a praying mantis's forelegs. "It is a very strange mix of characteristics that are otherwise only known for the unrelated insect groups," said one of the researchers to discover this new group of insects Günter Bechly, a paleontologist at the State Museum of Natural History in Stuttgart, Germany. From two adult and about 30 larval fossils that came from the Brazilian fossil deposit and are now contained in collections around the world, the researchers created a new order — a broad category that can contain many species — called Coxoplectoptera. This newly named group of insects is long gone; it has no modern descendants, and the fossils date back 120 million years to the early Cretaceous Period. 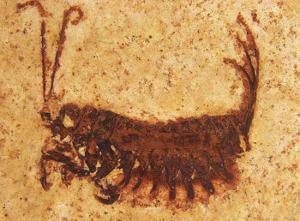 Image Credit: A fossilized Coxoplectoptera larva.